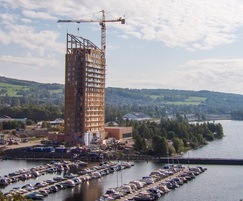 When it opened in March 2019, the Mjösa Tower in Norway became the world’s tallest wooden building. The 18-floor, 85.4m-high building provides homes, office space and a hotel for people wanting something different. The structure and facade of the tower are made of wood. The structure consists of glulam columns, beams and diagonal members, which are well-suited to high-rise buildings as the large cross-sections can meet fire safety requirements. Fast to build with, light and green Kerto® LVL (laminated veneer lumber) from Metsä Wood plays an important part in strengthening the floors. The first 10 floors, with offices and hotel facilities, are made of prefabricated wooden elements – with Kerto LVL Q-panels providing stiffness. Kerto® LVL is combined with glulam. Kerto LVL Q-panels were easy to process as a component of the prefabricated wooden elements at Moelven Limtre’s factory. Some of the Q-panels were pre-cut and sanded beforehand at a collaborator’s factory. “Kerto LVL is a lightweight and very straight material; thus, it guaranteed production without any delays. The quality of the product is very good,” says Rune Abrahamsen, CEO at Moelven Limtre. Cross-laminated Kerto® LVL also has a great strength-to-weight ratio. Lightness was also a benefit in the assembly phase. As all elements were prefabricated and light to handle, the structure grew by almost one floor every week. The main load-bearing structure consists of large-scale glulam trusses along the facades, as well as columns and beams inside the building. The trusses handle the horizontal and vertical global forces and give the building the required stiffness. CLT is used for secondary load-bearing in the staircases and elevator shafts and is not structurally connected to the glulam. Kerto LVL Q-panels in the floor elements help in the secondary load-bearing by transferring wind forces to the structure. Mjösa Tower has been built according to strict fire safety regulations. The whole building has a sprinkler system. Untreated solid wood creates its own fire-resistant surface because the outermost layer chars when exposed to fire, protecting against further fire damage. To sum up, massive wooden structures manufactured in large dimensions are a good choice as they maintain the load-bearing capacity in case of fire. In addition, each floor has been built as an individual compartment. The floor elements – including Kerto® LVL and glulam – have a 90-minute fire resistance. These elements have been upgraded with brackets so fire cannot get to the hollow areas. “Kerto LVL helped us to make the Mjösa Tower as sustainable as possible,” said Rune Abrahamsen, CEO of Moelven Limtre AS. As cities become more densely populated, the demand for more sustainable construction is growing, and the use of wood will play an ever-increasing role.